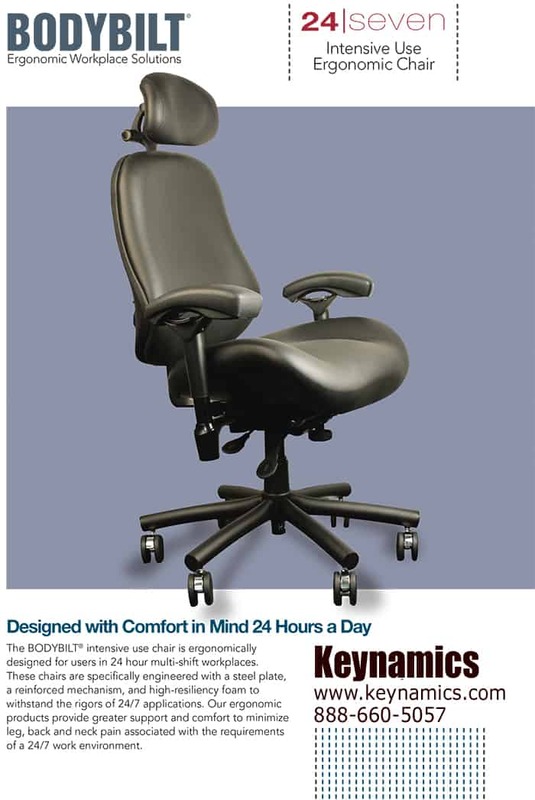 Our BodyBilt 24/7 line of special needs chairs for control rooms – Purchasing Manager’s Notes. We usually sell a fairly standard model for 24/7 use, which comes in two size ranges – regular and the “Big and Tall” model. This standard model is the Intensive Use “Core” series, constructed with a high double rub tested upholstery, which is also wipeable. It’s called “Staccato” fabric. This chair comes with a headrest and the Staccato fabric is the most durable of the all, and also the least expensive. The “Core” series chair is in the $1490 price range for the regular size model (plus shipping). Please see attached brochure. Typically, control rooms and call centers will need some combination of regular and the “Big and Tall” series – warranted up to 500 pounds. The Big and Tall series comes with a more substantial base mechanism and wider seat pan and adds about $175 to the chair. If you are only ordering one chair, you might consider the Big and Tall series, as a regular sized person can still use that larger chair, but a big and tall person can’t use the regular chair. To further accommodate a wide range of users – The seat depth is easily changed between shifts with the seat slider bar, located at the front of the seat pan. The best part of the BodyBilt chair line is that all parts are forward and backward compatible – allowing you to replace parts as needed down the road, even after the warranty period has expired. Most chair manufactures design obsolescence into the chairs so you have to constantly replace chairs every couple of years. We have sold to 911 call centers and control rooms for over 10 years with “zero” issues – customers only call us to tell us how comfortable and durable the chairs are after years of use. Please note: Oftentimes chairs fall under a company’s facilities group purchasing guidelines, where they have pre-approved vendors. This probably means that our company (Keynamics) might not be on that list of pre-approved vendors. When this has happened in the past – the purchase is allowed by falling under the “Special Needs” purchasing category and they will allow you to purchase from us. I will quote them as “special needs 24/7 control room chairs”. In order to give you a quote, first I will need to get a shipping / freight quote from the factory, so please let me know the ship to address and what type of 24/7 chair you would like quote. Keynamcis has been selling these 24-7 chairs for multiple shift use to 911 call centers and control room operations for over 10 years, with nit one call back, except to tell us they love them and want to order more. We can email brochures, please let us know.